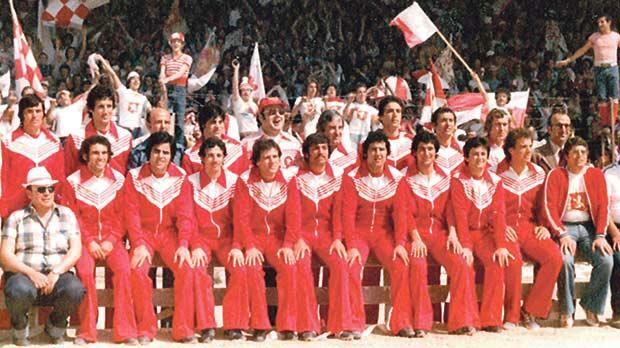 Valletta FC – 1978-79 league champions and FA Trophy winners. When in May 1978, Valletta met Floriana in the FA Trophy final they had an axe to grind. This was the fourth meeting between the two rivals that season and, to the Citizens’ obvious discomfort, Floriana won the first three. Valletta had already wrestled the league crown off the head of Floriana but along the way they had to bow their head twice to their neighbours in the league and, as if this was not enough, they were also beaten 1-0 by the Greens in the Sons of Malta Cup final. By the end of April, Valletta were the new league champions that season. Celebrations, as usual, were huge and long in the capital but one thing was missing… the celebration champagne was not so sweet without victory over sporting foes Floriana! Valletta started their trek to the FA Trophy final on May 21, 1978 with an easy victory over Msida St Joseph. At first, the Saints succeeded in containing the goal-hungry City forwards. However, gradually Valletta took over and in the process they scored five goals and created enough chances to add a dozen more. Marsa offered Valletta a much stiffer challenge than Msida when the teams met in the semi-finals a week later. The Red-Blues were two goals down after half an hour but pulled back a goal just before half-time. At the start of the second period they threatened to draw level on a number of occasions but much against the run of play Carlo Seychell killed their hopes with a third goal. The game was now won and lost. The Citizens took control but failed to add to the score. Floriana were eager to make up for their upset in the league with victory in the FA Trophy. They started with a 3-1 win over Ħamrun Spartans in the quarter-finals and continued with a hard-won game against Sliema Wanderers in the semi-finals. This tie had to be replayed after the first game had ended in a fair 1-1 draw. In the second match, the Greens were that little bit better than the Blues and at the end they just deserved to win with the minimum of margins. It was therefore another Valletta-Floriana final. This game could not have come at a better time for the Citizens. This time they were on top of their form and full of confidence. Floriana had Frankie Micallef, Donald Buhagiar and Ray Farrugia suspended after they got sent off in the semi-final. They also had George Xuereb and Julian Holland injured. The Greens did not relish the thought of playing Valletta with a depleted side. So, they asked the MFA to have the game played behind closed doors. As an excuse they quoted incidents that happened in recent past when the two neighbours met each other. Floriana argued that they were not in a position to give adequate protection to their players and supporters. This was, however, a lame excuse and the MFA saw through it and ordered that the match be played as scheduled. Valletta proved that their championship success was no fluke when they beat Floriana 3-2 in an exciting and heart-throbbing contest. This final was surely one of the most dramatic in the history of the competition. Up to 15 minutes from time, Floriana were leading 2-0. Their supporters were already celebrating when in an incredible twist of faith, two goals by Charlie Agius and another by Tony Giglio turned the table in favour of the champions. Revenge is sweet and one can only imagine the joy of the City supporters when the referee sounded the final whistle. Festivities in Valletta that night went on until the early hours of the morning.